Xaba and last year’s SPAR Grand Prix winner, Kesa Moletsane (KPMG), were among four runners who were disqualified after following the wrong route in the Pietermaritzburg race. After the race, KwaZulu Natal Athletics (KZNA) controversially overruled the findings of the jury of appeal that sat immediately after the race, and reinstated the athletes, naming Moletsane as the winner. However, Athletics South Africa (ASA) decided at its council meeting at the weekend that, in accordance with IAAF rules, the decision of the jury of appeal on race day should stand. The four athletes were once again disqualified and Irvette van Zyl (Nedbank) was declared the winner. 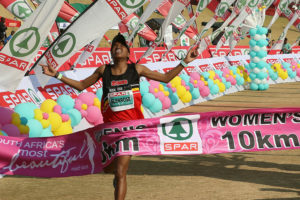 Xaba finished the six SPAR Women’s Challenge race series with 104 points to take the title and the R180 000 prize. She won the Pretoria leg of the race, finished second in Port Elizabeth, Cape Town and Durban and came fourth in Joburg. She was seven points ahead of Zimbabwean Rudo Mhonderwa (Nedbank), who showed the value of consistency in the SPAR Women’s Challenge series. Although Mhonderwa had no podium finishes, she was fourth three times, fifth once and sixth twice. Fellow Zimbabwean Rutendo Nyahora (Nedbank) was third, with 92 points, after podium finishes in Durban, where she came in second and Pietermaritzburg, where she finished in third place. Moletsane was the big loser from the ASA decision, finishing one point behind Nyahora. The KPMG runner won in Cape Town and Port Elizabeth and was third in Pretoria and Johannesburg. She finished in sixth place in Durban. Van Zyl, who is a three time winner of the SPAR Grand Prix, finished in fifth place with 85 points. Van Zyl had a remarkable series. She was third in Cape Town, despite being six months pregnant with her second child. She did not run in Port Elizabeth or Durban, but returned to the series in Pretoria, eight weeks after giving birth, where she finished in fourth place. Two weeks later she won the Pietermaritzburg leg of the race and she finished the series with an emphatic win in Joburg, where she earned bonus points for beating last year’s time. She was the only runner in the open category to do this.